The Vapamore MR-75 Amico Handheld Steam Cleaner gives you all the advantages of a steam cleaner in a small and convenient design. Do not be fulled by this tools diminutive size. The Vapamore Amico Handheld Steam Cleaner is big on cleaning power! Steam cleaners allow you to clean, degrease and sanitize without the use of chemicals. The Vapamore Amico Handheld Steam Cleaner delivers a powerful jet of high-temperature steam that gives it a powerful cleaning action on interior materials. The high-pressure steam is also a powerful degreaser, making the Amico ideal for cleaning engine compartments and areas of heavy buildup. Amico means friend in Italian. The convenient size of the MR-75 makes it extremely user friendly. The Vapamore MR-75 Amico Handheld Steam Cleaner fits comfortably in your hand, allowing you to take it anywhere. What's more, the Amico comes with a wide variety of attachments which will allow you to clean a huge variety of surfaces. 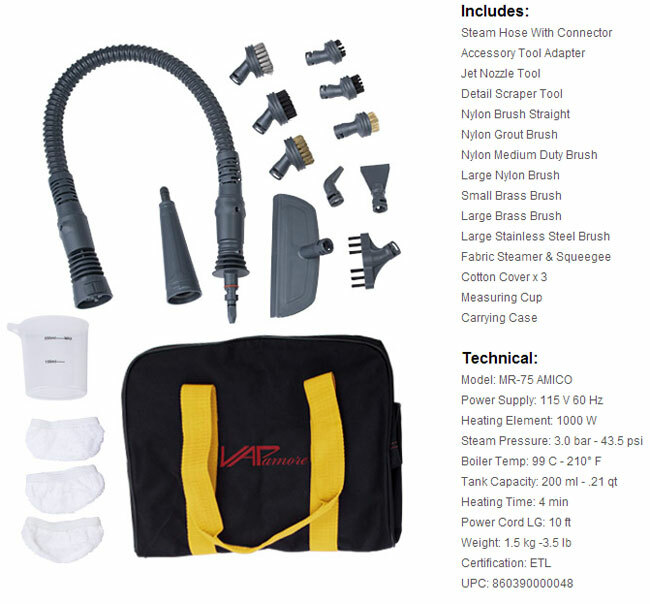 Not only is the Vapamore MR-75 Amico Handheld Steam Cleaner ideal for mobile detailing, but is perfect for cleaning and sanitizing bathrooms, kitchen counter tops and other household areas! User tip: Use distilled water to fill the reservoir. Hard water will cause buildup that affects performance. *Discounts are not applicable on this item. This item ships from the manufacturer via ground service. Expedited and international shipping are not available.